WHICH MEN FOR WHICH FLIGHT CREWS? How did Deke select the men to fly? Mostly by seniority. An astronaut stood in line until his turn came, though the order of assignment within his own group was important. "They are a durn good bunch of guys, real fine troops, a bunch of chargers", said Slayton in 1972. "It's not the kind of organization where you have to keep pointing people in the right direction and kicking them to get them to go. Everybody would like to fly every mission, but that's impossible, of course. They all understand that, even if it makes some of them unhappy." 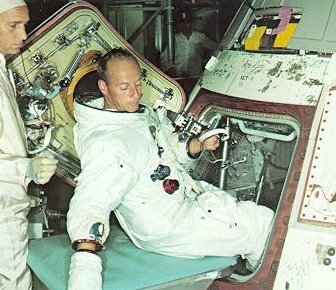 Slayton was rarely accused of unfairness, a remarkable achievement considering the stakes involved; his own eventual assignment at age 48 to the Apollo-Soyuz mission was universally popular. 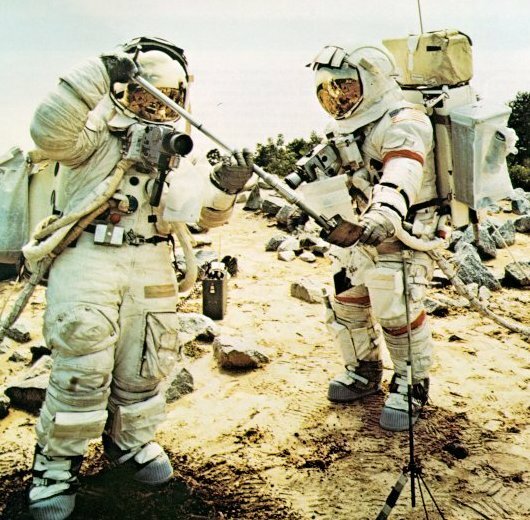 On mock lunar terrain, wearing restrictive pressure suits, Schmitt and Cernan practiced collecting geological samples. They were drilled in formal sampling procedure: locate, radio description of size and color, photograph in place by the gnomon, and then collect in numbered plastic bags. Fitted with Earth wheels and performance characteristics to match those expected on the Moon, a version of the Moon buggy was driven on rough terrain until its handling traits were second nature to the astronauts. They learned its steering feel, braking ability, and grew familiar with its guidance and navigation calculator. Here Astronauts Scott and Irwin practice for Apollo 15. Not all astronauts were equal, of course. Before the first manned Apollo flights six crews had been formed, commanded by Schirra, Borman, McDivitt, Stafford, Armstrong, and Conrad, who had shaken down as the natural leaders with appropriate seniority. Before he flew Apollo 7 Schirra announced he was quitting afterward, and that left five. Which one would land first on the Moon? It depended on the luck of the draw. 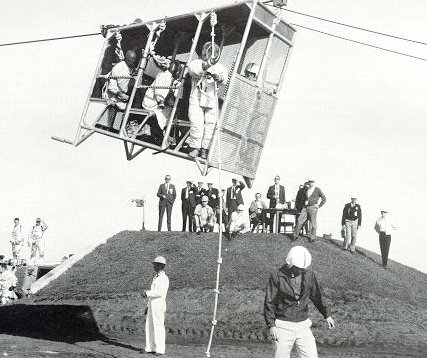 "All the crews were essentially equal", said Slayton, "and we had confidence that any one of them could have done that first job." Either Borman or McDivitt seemed likeliest to be first on the Moon; after they flew their early Gemini missions they were sent straight to Apollo instead of being recycled into later Gemini flights. But in 1968 two things happened to derail this prospect: McDivitt, scheduled to lift off on the first Saturn V (Apollo 8), declined the opportunity because it would not carry the LM, on which he had practiced so long. Borman, scheduled for Apollo 9, was "highly enthusiastic" about Apollo 8, LM or no LM, but in deference to wife and children he decided that this would be his last flight. It's a long way down. The astronauts had to train for the possibility that during countdown their launch vehicle could turn into a bomb. The rig shown here was practice for a ride for life from the 320 ft level of the Mobile Launcher. The astronauts would, if necessary, enter the cab and zoom down the guide wire into an underground, padded and insulated room, safe from explosion. Astronaut Roosa prepares to climb down. Getting in and out of the hatch: a necessary element in training. Before launch, an astronaut had to fit into a very cramped space without rearranging preset console switches. During return from the Moon, it was also necessary for one man to get out and return through the CM hatch to retrieve the film and data cassettes from the service module. Borman's back-up was Armstrong; McDivitt's was Conrad. In each case, the back-up shifted with the prime, so Armstrong in the normal rotation became Apollo 11, and Conrad lost his chance to be first man on the Moon by becoming Apollo 12. There was also the possibility that Apollo 10 (Stafford) might be the first Moon lander - George Mueller initially saw no point in going to the Moon a second time without touching down. But for this one the LM wasn't completely adapted for the task (it weighed too much) and the program management decided they were not ready for the big step. When the batting order was aligned in the summer of 1968, nobody could have forecast how the assignments would sort out.